Soft, natural shades impart a warm tan-peach tone from very fair to subtle tan-rose. Suitable for male and female actors with very fair to the darkest skin tones. The foundation or "base" chosen by an actor sets the tone for every live theatre, big screen or video performance. Make up artist, teachers, directors and designers in every stage setting from opera to children's theatre use theatrical foundations. 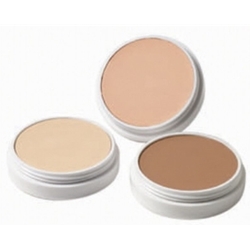 Creme foundations offer a broad palette, silky consistency and intense pigmentation for today's lighting and demands. The bases supplied by The Costumer blend effortlessly with Creme Rouges, Highlights, Shadows and Lining Colors. Ben Nye Creme Foundations are best applied with a latex sponge.